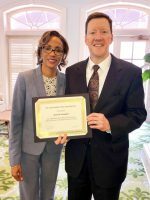 Attorney Jim Slaughter was recently recognized by the Greensboro Bar Association for his pro bono work by being named to the Herb Falk Society. The Herb Falk Society honors Bar members who have performed 75 hours or more of pro bono service hours during the year, which includes free or reduced legal services to clients and activities to improve the legal profession. This is Jim’s 7th year of recognition. His is pictured here with Judge Teresa Vincent, 2019 President of the Greensboro Bar Association. This entry was posted in HOA & Condo Associations, Parliamentary Law, Uncategorized by Administrator. Bookmark the permalink.